Do you blame it on the weatherman? When faced with problems do you say "e;C'est La Vie"e;? Do some people say you look like your dad? Well then, you'll just love the B*Witched Quiz Book! 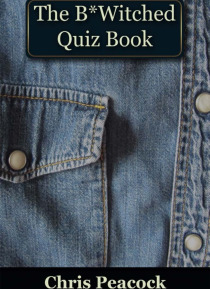 Chock full of 50 questions to test your knowledge on the double-platinum selling all-girl group, this book is great fun for time on your own and with friends! Written by top-selling celebrity biograph… er Chris Peacock, this is one bargain buy you don't want to miss.